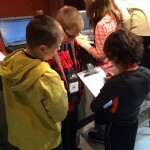 On Thursday, February 4, we traveled to Colorado Springs to visit the Space Foundation Discovery Center. We had such a great time learning about space! 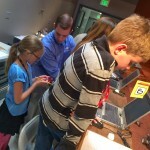 We are very grateful to the staff of the Discovery Center for helping us learn more about our solar system. When we first arrived, we walked into a very dark room. There was a giant sphere with some very tiny wires holding it from the ceiling to the middle of the room. We also noticed four projectors in the room in four different corners. Our guide told us that those four projectors would project images on the sphere, so that the entire sphere would be covered. It was a 360º image! This is called “Science on a Sphere.” Our guide showed us all the planets on the sphere. We thought it was so cool! As we looked at all the planets, we learned something unique about each one. When we started to look at Saturn, our guide was able to rotate the planet on the sphere so that we could see the top of Saturn. Did you know Saturn has a storm on its top? We noticed that the storm is 6-sided, and that is called a hexagon. 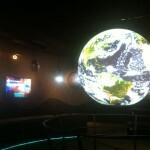 After we finished in the Science on a Sphere room, we walked around the Discovery Center gallery. We noticed a lot of space suits, examples of food that astronauts eat, and some scale models of rockets, rovers, and other spacecraft. 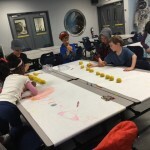 After our tour, we spent time in a classroom at the Discovery Center learning about scale and planets. 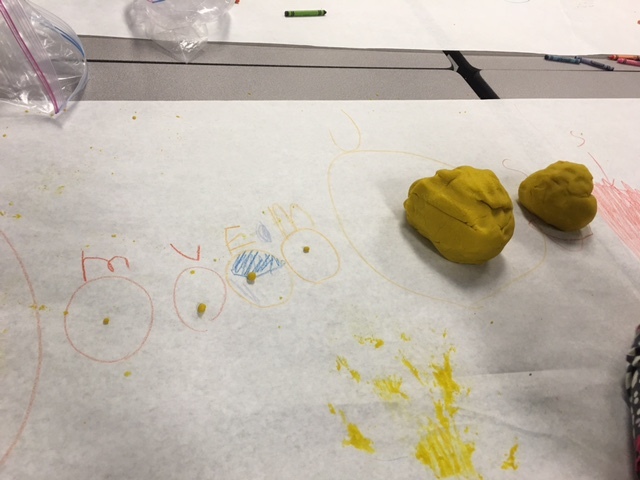 We got to use some modeling clay – 3 pounds! – to create scale models of the planets in our solar system. When we finished, we noticed how huge Jupiter and Saturn are. 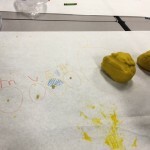 We added Pluto, even though it got kicked out of the “planet club.” When we finished with our scale model of the solar system, Pluto was a tiny little crumb! JF: I learned that Jupiter has a big red spot. It’s a storm. WG: Saturn has a storm that’s shaped like an eye. I liked that we were making a model of the solar system, because it helped me learn what the sizes of the planets are actually like. 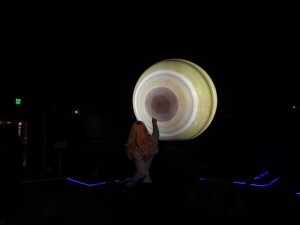 CRC: I liked seeing the planets (on the sphere), because I’ve never seen the planets before. EO: I liked Neptune (on the sphere), because it’s all blue. I like blue! NK: I learned that Saturn has a storm, because I didn’t know that. 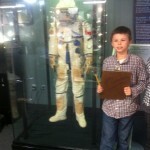 We are very grateful to the people at the Space Foundation Discovery Center. Thank you so much for taking the time to help us learn more about space! 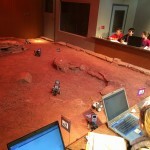 Last week, we returned to the Space Foundation Discovery Center in Colorado Springs to take part in their Mars Rover simulation! 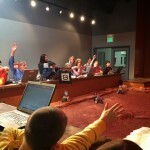 Yes, we were very fortunate to be one of the first classrooms to participate in this activity. So exciting! 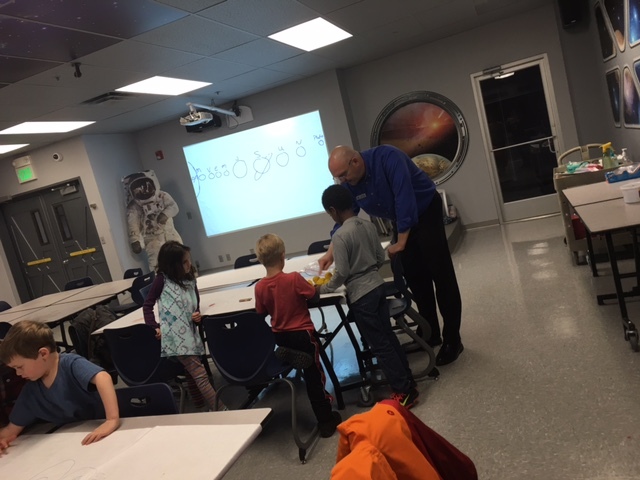 When we arrived, Team Baldwin and Team Weissman (another awesome class from Anastasis) met in the simulation lab and learned about the history of the different rovers sent to Mars. 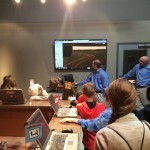 The Discovery Center team talked to us about each rover, its capabilities, and what they have learned about Mars so far. The most recent rover sent to Mars is called Curiosity. We love that name! The lab looks a lot like the terrain on Mars! We looked at what they had created and then thought about which items might actually be on Mars versus those that look man-made. Some of us were really surprised when it came time to “drive” the mini Mars rovers. We had assumed that we would use controllers like we have at home for Wii or Xbox. Instead, each station had its own laptop. The Discovery Center team divided us all into groups of 3 and then gave each student a role: Commander, Pilot, and Data Engineer. The Commanders decided which “moves” to execute. The Pilots used the program on the laptop to execute the moves, and then the Data Engineer recorded all the energy levels based on multiple factors for each move to make sure that we didn’t run out of battery before getting to our destination. 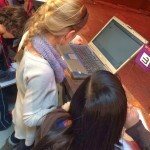 Each student in the group took turns in all three roles. Lots of math, trial and error, and problem-solving! We had a great time learning about the rovers! One of the things we learned was that when one of our mini rovers got stuck, the team could walk into the simulation and help us out. If that happens to Curiosity, no one can just take a quick trip to Mars to fix it. If Curiosity gets stuck, it’s a billion dollar mistake. Now we know why the commanders, pilots, and data engineers for NASA have to move very slowly and really think about each move that Curiosity takes. 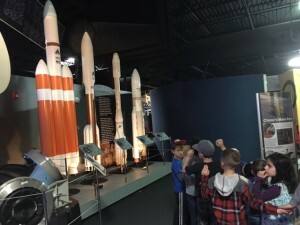 On Friday, October 18, we went to the Space Foundation Discovery Center in Colorado Springs. It was awesome! 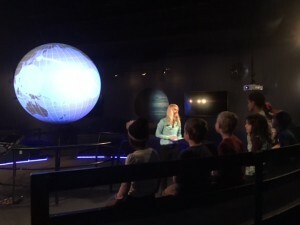 Our guide, Bryan, took us to our first stop in the Science On A Sphere room. In that room, we saw a sphere hanging from the ceiling, and four different projectors in the room projected images and video on the sphere. One of the things he showed us was the image of the sun that covered the sphere. Layered on top of the sun were all the planets, so we could see their size compared to that of the sun. Sometimes, the sphere showed us different planets, and sometimes we saw different moons in our solar system. 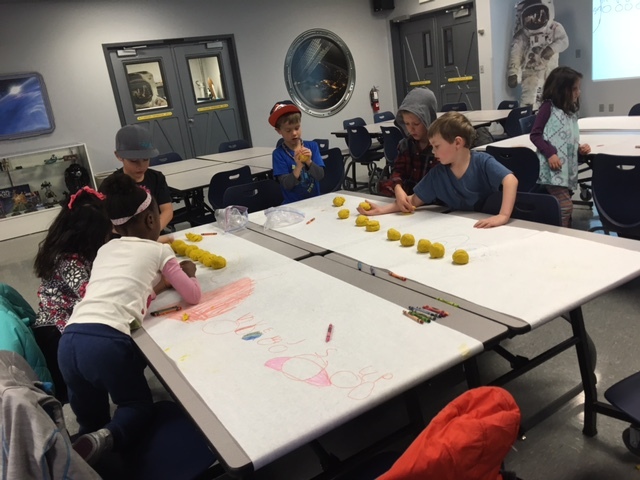 For the next activity, we moved to a room called “Area 51” to create a scale model of the distance between objects in our solar system. 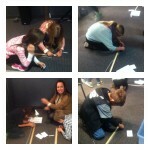 We learned about “astronomical units,” called AU. We used yarn, labels, and meter sticks to create this project. For example, if Earth is 1.o AU from the sun, it was 10cm on our yarn. If Jupiter is 5.0 AU from the sun, it was 50 cm on our yarn. Next, we toured a room about space exploration. 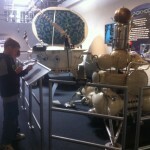 There were replicas of lunar modules, space suits, shuttlecraft, and much more! We went on a scavenger hunt to find and learn about all the different types of space exploration. We finished the day eating lunch with our guide, Bryan in the Area 51 room. 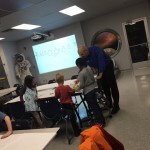 We had a great time learning more about space, and we’re looking forward to going back to the Discovery Center!